your calls onto defined numbers on the specified time frame expiration. It allows you to use your mobile plans of certain operators with a maximum profit. operator allows you to talk free of charge for the 5 minutes by day with certain numbers. and ask you for do you want to continue conversation or finish it. Features Monitoring calls – main application status. “Yes” – means that the application is watch your calls, “No” – application if off. During the work there can be some delays in the commands processing. Besides real call time that is calculated by your operator can differ by few seconds from the time that you see on your phone screen. number will not be monitored. defined the time frame expiration. By pressing “right” or arrow on the screen’s top-right area, you can switch to the white phone numbers list. In this window you can add desired phone numbers on which the selected rule will be applied. selecting them directly from the contacts list. 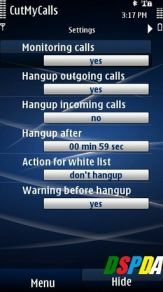 exit with the “Monitoring calls” option set to “No”. Alexander Fokin CutMyCalls v1.5 S60v3 S60v5 S^1 S^3 Anna Unsigned Retail By DSPDA™ URL http://symbian2share.blogspot.com/2011/09/alexander-fokin-cutmycalls-v15-s60v3.html. NEXT.